Thank you for allowing Thyro-Cat to be part of your cat's health care team. Our objectives are to make sure your cat is an appropriate candidate for I-131 treatment, to treat the condition and to manage your pet with respect and dignity in a comfortable environment. The most effective health care team consists of a knowledgeable owner, a primary care veterinarian who works closely with the radiation oncologist, and a caring support team of technicians who monitor your cat while in our facility. Hyperthyroidism is a disease caused by excess amounts of circulating thyroid hormone in the bloodstream. This is a common medical condition in middle aged to geriatric cats, and it usually results from one or more benign tumors of the thyroid gland. The condition may be caused by multiple factors including congenital, inflammatory, toxic and/or nutritional processes. What is the best way to treat this condition? In those patients that are appropriate candidates, radioactive I-131 has proven to be the preferred therapeutic regimen compared to surgery, medicine and/or diet. I-131 therapy is curative in greater than 95% of patients. Is my cat an appropriate candidate for I-131 therapy? The majority of patients we treat are older/geriatric cats. There may be co-existing disease processes, unrelated to the hyperthyroid condition, such as cancer, heart failure, or severe organ dysfunction. Therefore, it may not be appropriate to proceed with I-131 therapy if there is a known condition that will cause your cat to become progressively ill independently of how the hyperthyroid condition is treated. For this reason, we need you and your veterinarian's help in providing us with meaningful historical information, insights into your pet's health problems and idiosyncrasies, current blood work and radiographs. Our concern with underlying and unassociated diseases is why we perform a screening chest/abdominal ultrasound prior to determining if the I-131 is to be injected.Our concern with underlying and unassociated diseases is why we perform a screening chest/abdominal ultrasound prior to determining if the I-131 is to be injected. The more information we have, the better we can be in assuring the health care needs of your cat are met. What about performing additional imaging studies such as a nuclear scan, CT, MRI before proceeding with I-131 therapy? All of these imaging procedures are appropriate under the right circumstances. If there is a concern about how best to proceed after the medical record, lab results, and radiographs have been reviewed, we will discuss with you and your veterinarian if it is recommended any additional diagnostic tests are to be pursued. We have found that being selective with the use of any additional imaging studies is more appropriate than requiring them for all patients. What should I do if I have questions prior to, during and after I-131 therapy? If you have any questions or concerns about the procedure, case management, radiation safety, health care issues or post radiation safety precautions, you should contact the Thyro-Cat main office. The office treatment coordinator will answer questions, address concerns and keep you updated on your cat's health during his/her stay. The Thyro-Cat office is staffed with licensed veterinary technicians who have many years of experience and are knowledgeable in managing feline hyperthyroid patients. They are familiar with each individual case and are aware of the state and federal mandates concerning radiation safety and are in constant contact with the veterinary radiologist/radiation oncologist that oversees the treatment regimen. It's important for all owners/caregivers to understand the interactions and therapeutic regimen prior to bringing the cat to the Thyro-Cat center. The admitting staff at the Thyro-Cat facility has been instructed to care for your cat and to direct all therapy and management questions to the Thyro-Cat main office. This allows for continuity of patient care and helps prevent misunderstanding with the people involved in the I-131 program. What happens after the admission process? After your pet is admitted to the Thyro-Cat center, and the I-131 is injected, your cat will stay with us for 3 to 5 days. The Thyro-Cat facility where your cat will be treated is staffed with technical support personnel accomplished at making sure your cat is in a safe and clean environment during its stay. The support staff at the Thyro-Cat facility are in constant contact with the Thyro-Cat main office. They continuously provide us with data, contact us with updates, and concerns as needed. You can be assured your cat is well cared for while under their supervision and they will immediately update the Thyro-Cat office if there are any problems. Each pet is monitored, fed, given fresh water and their activities are recorded on an ongoing basis every day. We provide large, clean cages with plenty of ventilated fresh air and provide cat friendly videos for your cat to enjoy. Once your cat has been injected with the I-131, the amount of interaction between the pet and support staff is limited by law because of the concerns for radiation safety for the staff members. 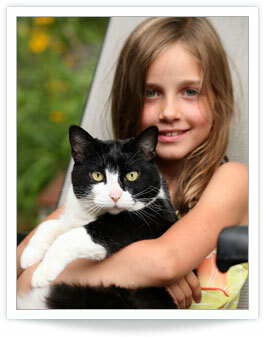 This is why your cat cannot be injected and immediately sent home with the owner/caregiver. These patients are basically "radioactive." As the radioactivity becomes concentrated in in the thyroid gland, it kills the abnormal thyroid cells. It is this eventual selective concentration of the I-131 in the thyroid gland that makes this therapy so effective (>95% cure with one injection). It is this relatively high level of radioactivity that requires limited interaction with the pet during their stay in the Thyro-Cat facility. They cannot be removed from their cages to be cuddled, played with, or allowed to roam freely in the Thyro-Cat room. This would be inappropriate and dangerous for those managing the care of your pet. If there is a health concern, the overseeing veterinarian will take the necessary actions to assure appropriate health care is given. What happens if my pet needs to be treated for other conditions during his/her stay at Thyro-Cat? The majority of cats we treat have not been away from home for an extended period of time. Cats that have more shy/sensitive personalities may not want to eat, drink, or use their litterbox for the first 24 hrs after admission. We will, of course, proceed to treat your pet as needed to assure a stable health status. These measures often involve supportive care to help with food or water intake and elimination issues if they arise and there will be additional fees associated with this. However, should this happen, we will try and interact with you so we can best ascertain the treatment plan that your cat will require, but if we cannot contact you through the information left at the time of admission, we will continue to treat your cat as needed to assure, as stated, a stable health status. Pets coming in for treatment should be eating, drinking, urinating, and defecating at home. They should be as stable as possible before receiving the therapy. Federal law mandates that the cats cannot be removed from the room post treatment for a minimum of 72 hrs, even if they become seriously ill. We will do the best we can within the limits of the law to assure a stable health status. Why don't you return food, medication and personal items when my cat has completed the I-131 therapy? Your pet can be released from the Thyro-Cat facility when the monitoring process indicates the I-131 radioactivity has decreased to a level considered safe by State and Federal Agencies. The items that were taken into the Thyro-Cat facility with your pet may still have radioactivity on them. As such, we do not want to expose you or your cat to any radiation that is not absolutely necessary as part of the Thyro-Cat protocol and as mandated by licensing agencies. Therefore, what goes into Thyro-Cat, except for your pet and the carrier, has to stay in Thyro-Cat. Please be selective with the personal items you ask to leave with your cat while staying in our facility and realize that we cannot accept all items. Why must some pets stay in the Thyro-cat facility longer than others? After the I-131 is injected, it is distributed throughout the body. The useful I-131 is concentrated in the Thyroid. The majority of the I-131 that is not in the thyroid gland is removed from the body in the urine and feces. Your cat cannot be released from the Thyro-Cat facility until the amount of radiation in his/her body is below a level mandated by law. It is a minimum of three days (72 hours) and can take as long as 5 days (120 hours). We have no option but to abide by the law. We cannot release your cat from our Thyro-Cat facility until the appropriate value has been reached. Other factors such as family environment, pregnancy and the presence of children can require the need for the lowest level of activity detected before release. What happens if I cannot come to get my pet for any reason when he/she is ready to be released from the Thyro-Cat facility or if I want to board the pet beyond the required stay? If you bring your pet to a Thyro-Cat facility, we are a member of your health care team, and we will do all we can to meet your needs and our goal is to exceed your expectations. Additional charges will be incurred for boarding and patient management beyond what is a routine and customary part of the Thyro-Cat regimen. These additional fees will be discussed with you if you wish to have the pet spend additional time with us. What happens if my pet becomes sick after treatment? Some diseases may not be apparent before I-131 therapy but progress and express themselves within a short time after the therapy. We are always available as needed to interact with you and your veterinarian to define these disease processes as they occur and make recommendations for therapy. We do not want to treat a patient that we do not believe will have a positive benefit from the I-131 therapy. We are all deeply affected if a patient does not do well for any reason. Unfortunately, this can happen and it is beyond everyone's control. Ultimately, we want everyone involved to do all they can to help your cat and understand that all appropriate efforts were made to prevent/treat any unanticipated outcome. Our protocols are based on our years of experience and expertise. You'll be asked to complete a survey at the end of the procedure so we can continually provide the best experience possible to our clients and patients. We request follow-up bloodwork from you and your veterinarian so we can remain updated on the health status of your cat. We are always available as needed to speak with you, your primary care veterinarian and others who are involved in the health care needs of your cat.